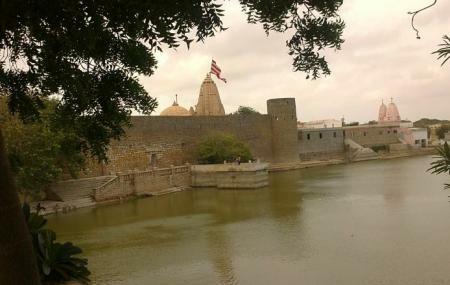 One of the popular pilgrimage sites of Bhuj is Narayan Sarovar. It is said to be one of the 5 holy lakes of Hinduism in India. According to the legends associated with the lake, this holy water body was said to be formed by Lord Vishnu during the time of drought in Puranic area. Today,the lake also has a temple of Lord Narayan that houses a deity of Vishnu. Many people come here to take a dip into this holy water. If you get time from your travel schedule, pay a visit to this religious site. For the temple timings, ask the locals. How popular is Narayan Sarovar? People normally club together Gujarat Institute Of Desert Ecology and White Desert while planning their visit to Narayan Sarovar. Good place to visit but should be visited at winter only. Too hot. Visit here for the beautiful views of sunrise and sunset. The.lake was almost dry☹️. The water was dirty. Some people were conducting tarpan and blocked the only place where there was some decent water.